A vivid imagination allows us to envision or mentally rehearse future possibilities. 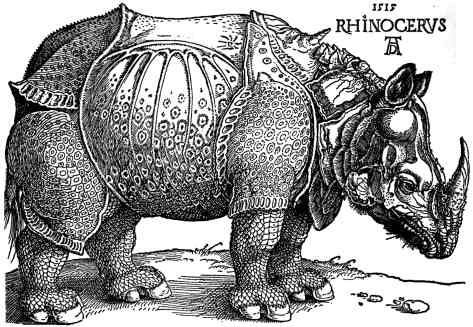 Albrecht Dürer (1515) Rhinocerous. Print from woodcut. The woodcut is not entirely a product of Dürer's imagination. It was based on a written account and brief sketch of a single specimen brought to Lisbon. It was thought to be a unicorn at first. The King of Portugal eventually offered it to the Pope as a gift. Get things started by projecting the Dürer, Doré, Rousseau and Bosch images and showing the Wagner video. 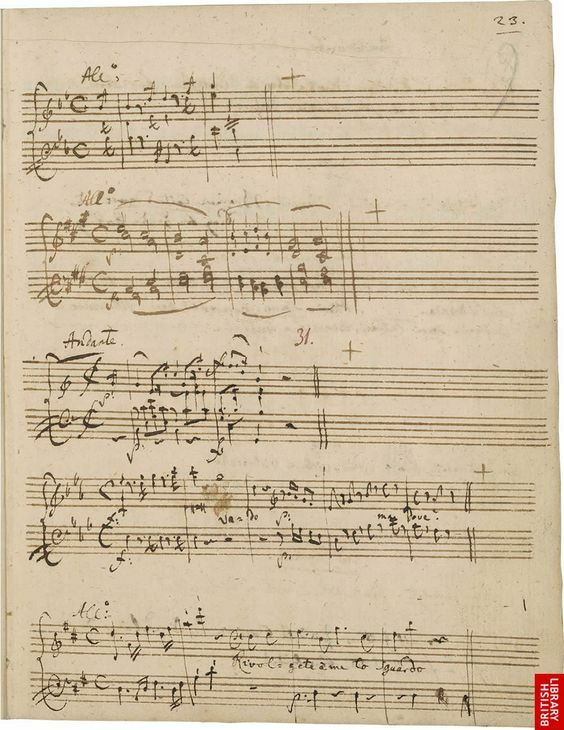 Spend some time on the handwritten Mozart score and the associated talking points. This should unleash some lively whole class conversation about the power of exceptional artistic imagination. Be open to any spontaneous additional examples and insights offered by the students. The Robert Frost quote is a foreshadowing of the second class activity which moves beyond the role of imagination in the arts to selected academic disciplines and the CAS experience. Wordsworth's Nuns Fret Not at Their Convent's Narrow Room first should be read in silence; then read aloud to the whole class by a strident volunteer. Printable pdf. A few students may recognize the sonnet form; and (perhaps with some prompting) be able to outline the sonnet structure with its 14 lines, strict meter (in this case three quatrains and a couplet) and prescribed rhyming patterns. Invite students to mark up the end of the lines of the poem with the letters a, b, c and d to discern the precise rhyme scheme. Don Quixote by Miguel de Cervantes illustrated by Gustave Doré. Plate 1. It is astonishing to think that Mozart wrote most of his original scores by hand in one take without corrections. And to think that the marks on the score consists of a few milligrams of ink sitting precariously on a finely textured paper surface! The creative imagination of course, is in the patterned arrangement. And, how strange to ponder that, at the sub-microscopic level of atomic physics, the sepia ink marks do not even touch the paper surface! Multitudes of identical vibrating atoms in the ink seem to hover above those of the cellulose-based paper. The buffeting is caused by the repulsion of electron clouds of adjacent atoms. The score is a code. Mozart could hear the piece in his head. For lesser mortals it only comes alive when performed by trained musicians. And here is a final thought...How can quasi-mathematical, patterned puffs of air, gently pummeling the elastic tympanic membranes of a smart, self-aware ape species, directly evoke emotion… sometimes very strong emotions: like nostalgia or patriotism, or even the sublime? "When I go into the glass houses and I see the strange plants of exotic lands, it seems to me that I enter into a dream." Poet Robert Frost's tart dismissal of 'free' verse: from Newsweek, January 30, 1956. In this activity students will work collaboratively in pairs. If possible, try to arrange the pairings so that at least one student is studying HL math, physics or chemistry. Begin by showing the Feynman chess analogy video. Feynman portrays brilliantly (and as always sounding straight out of Queens, New York) the scientific method pushing incrementally against real world constraints to obtain ever increasing tentative understanding. After the video, invite the students to make a close reading of the Feynman "straitjacket" quote. Invite them to relate this to Robert Frost's "playing tennis with the net down" encountered in the first class activity. Follow this with Proust's "tyranny of rhyme." This should set the stage for some further exploration of imagination with constraints. No need to jump the gun; but students should be glimpsing the paradoxical meta-notion that rather than stifling imagination, constraints promote it! — No Ordinary Genius: The Illustrated Richard Feynman. Edited by Christopher Sykes. Norton, New York. What is the role of imagination in this academic discipline? What are some of the real world constraints in this academic discipline? How do the constraints you have noted help or hinder imaginative thinking in this academic discipline? The academic disciplines in the table are carefully selected subsets of some non-artistic Areas of Knowledge. The focus here is on expert Shared Knowledge. In setting up the activity make sure that the entire class understands the categories. For example, Cosmology is the physics of the origin and development of the universe and would include ideas like string theory, Multiverse and the big bang. Transfinite math sounds daunting but can be demystified by telling students that it is a special branch of math that has been invented to explore formally the strange consequences of the concept of infinity. For economic forecasting: consider, for example, the role of the Governor of the Federal Reserve who periodically sets benchmark interest rates. Invite students to include a CAS example of their own. This will add a vivid, real world Personal Knowledge dimension. Some mention of the interplay between imagination and constraints in, say, athletics or service learning will further enrich and ground the conversation. Allow a full, timed 15 minutes for this activity. Printable pdf. of table, questions and quotes. What is the role of imagination in creativity/out-of-the-box thinking? Do we need mastery in a discipline before we can improvise? To what extent is creativity problem solving to constraints? To what extent has your own experience in being educated in certain academic disciplines stifled or helped you retain your own sense of child-like curiosity and imagination? Is Memory a promoter or a constraint on Imagination as a Way of Knowing? These questions should promote lively whole class discussion. The final question is of special interest and provides an intriguing segue to exploring Memory as a Way of Knowing. After working through the two class activities students might well agree that memory is both a promoter and a constraint on imagination. At this point invite everyone to pause and take a deep breath. Only if the moment seems right, you could push the thinking one more notch, and continue with "Are Imaging and Remembering Almost the Same?" which appear under the image below. It may be a step too far! If so, it can be saved until the class is ready to tackle the "Who do you think you are?" unit in Memory as a Way of Knowing. Image from Dr. Todd Girard and his team at the Brain Imaging and Memory Lab at Ryerson University, Toronto.